TOKYO – On his first visit to Tokyo as newly elected President of the World Baseball Softball Confederation (WBSC), Riccardo Fraccari met Kiro Mori, President of the Tokyo 2020 Executive Board last week. Fraccari was determined to make the trip to Tokyo following his election to confirm that the WBSC will be increasingly committed to placing baseball and softball – Japan’s national sport – at the service of the Olympic Movement and at the service of the Tokyo 2020 Olympic Games. The new world leader of baseball and softball provided his assurance to President Mori that the WBSC would give its total cooperation for incorporating baseball and softball on the Olympic Programme to help further enhance the Games-experience and culture – and to help boost awareness and excitement leading to 2020 – should there be favourable considerations by the IOC members to welcome back baseball and softball, which have been strengthened and united under the WBSC. Japan won the gold medal in the 2008 Olympic Games, and it is has been suggested that the presence of Japan’s national baseball and softball teams competition for an Olympic gold medal at the 2020 Tokyo Games would produce massive ticket sales, create a media frenzy and generate a nationwide buzz that would extend worldwide. Newly elected WBSC Executive Board Member from Japan – softball star, Ms. Taeko Utsugi, also participated in the meeting with Tokyo 2020. The WBSC delegation included Japan’s both baseball and softball (separate) federation leaders, Eiji Hatta, President of Baseball Federation of Japan and Hiroshi Tokuda, President of Japan Softball Association, signifying a single voice for two sport disciplines –under the WBSC— to work together to rejoin the Olympics and set the stage for other long-term strategies for long-term development of baseball/softball in Japan and globally. Katsuhiko Kumazaki, the leader of one of the world’s premier professional baseball leagues and WBSC Associate Member, Nippon Professional Baseball was also involved to confirm NPB will strengthen ties with WBSC and fully support the young federation under President Fraccari, including work on the Olympic campaign. 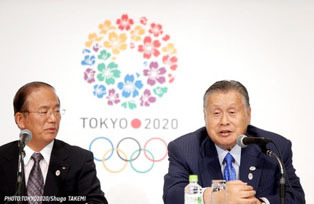 The meeting was also attended by Japan’s national sports icon, baseball player, Sadaharu Oh, who was recently appointed to the board of the Advisory Meeting of President Mori’s Executive Board. After the meeting with President Mori, WBSC President Fraccari and his team members briefly visited President Tsunekazu Takeda, President of the Japanese Olympic Committee.